We are offering wide range of Industrial Rubber Products. These are designed using high quality raw rubber which is sourced from our reputed vendors. Our wide range of Industrial Rubber Products is highly demanded in the markets due to its vast use in all the industries. We offer these rubber products at an affordable range. 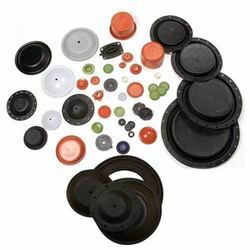 Engaged in offering wide range of Rubber Diaphragms. These rubber diaphragms are manufactured made-up of high-grid quality raw materials procured from trusted vendor. Our products are highly appreciated by customer for their high efficiency and quality. Our range of rubber diaphragms are highly demanded by our clients across the globe. Our Rubber Diaphragms are offered with or without fabric reinforcement in the global market. This quality approved Rubber Diaphragm is used for sealing different pressure gauges.